Swollen lymph nodes in the neck are a common source of neck pain. Most often they are a sign of infection and, once treated or resolved, the lymph nodes will return to normal and the neck pain symptoms will also disappear. Usually, it is difficult to feel the lymph nodes in the neck unless they are enlarged (more than a centimeter across or so) but careful exploration with the fingers can locate the chain of lymph nodes down each side of the back of the neck, on either side of the anterior neck, and on both sides of the neck. Swollen lymph nodes may also occur due to inflammation, an abscess, or even cancer, although the latter will usually occur over time and without producing pain, unlike the acute neck pain and swelling seen in infection. Lymph nodes are also present in the armpit, groin, at the back of the head, under the jaw and chin, and behind the ears so if you suspect an infection is at the root of your neck pain it can help to see if you also have swollen lymph nodes in these places. 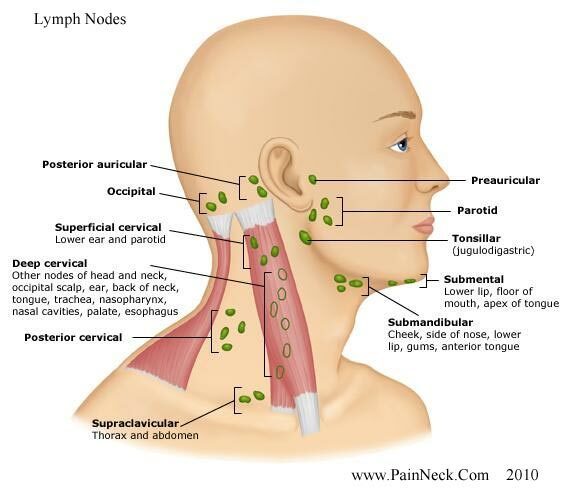 The lymph nodes are part of the lymphatic system that spreads throughout the body. The nodes are made up of cells called lymphocytes which are responsible for producing antibodies to infectious agents. It is in the lymph nodes that the immune system commonly interacts with foreign invaders such as bacteria and viruses and the lymph drainage system helps to clear the debris resulting from the ongoing battles between such unwanted microorganisms and the immune system. Lymph itself contains white blood cells, intestinal fluid, and some red blood cells which are filtered through the lymph nodes and ducts to pick up and drop off antigens. When there is an active infection the activity of lymph nodes increases and the lymph nodes swell with the added white blood cells and greater quantity of lymph circulating around the the body to fight the infection. Patients with neck pain from rheumatoid arthritis may have their pain compounded as this autoimmune condition also causes swollen lymph nodes in some cases. Anti-seizure medications and some vaccinations may trigger swelling of lymph nodes in the neck and many types of cancer can cause lymph node swelling independent of tumors in the neck itself. The most common cancers to cause swollen lymph nodes are leukaemia, Hodgkin’s disease, and non-Hodgkin’s lymphoma. While it is important to establish the cause of lymph node swelling in the neck or elsewhere in the body the neck pain from swollen lymph nodes usually resolves within a day or two, even without treatment. The swelling itself may take longer to dissipate as the body remains on alert for a few weeks after infection. The neck pain caused by lymph nodes is commonly due to the sudden enlargement of the nodes during the acute phase of infection. If swollen lymph nodes do not reduce in size after several weeks then it is important to see a physician. Lymph nodes can usually be palpated but if they feel hard, irregular, or immobile they should also be checked by a medical professional. Red and tender lymph nodes in the neck are also cause for concern as are symptoms such as weight loss without apparent cause, fever, and night sweats. Neck pain in children with lymph nodes larger than a centimeter across should be investigated to rule out serious cause. When diagnosing the cause of neck pain from swollen lymph nodes it can help to know when symptoms began, whether the swelling and pain came on suddenly or over time, if the size of the lymph nodes fluctuates, whether the condition is symmetrical (both sides of the neck are swollen), whether the lymph nodes themselves are tender, and whether the skin on the neck over the lymph nodes appears irritated and/or red. Common tests for unexplained persistent swollen lymph nodes in the neck include a thorough physical examination including blood tests to rule out liver dysfunction, kidney problems, and immune system irregularities. A biopsy may be carried out of the lymph nodes and chest x-rays may be taken to see if the large group of lymph nodes located there are visibly swollen. Where neck pain is accompanied by an upper respiratory infection it is likely that the pain is a result of swollen lymph nodes. Swelling of lymph nodes around the body may be due to a systemic infection such as mononucleosis (mono), or a fungal or parasitic infection. Lupus and neck pain may also be connected due to lymph node enlargement, as can rheumatoid arthritis or other autoimmune condition such as Hashimoto’s thyroiditis. There are numerous reasons why swollen lymph nodes in the neck may be connected to neck pain, many of which are short-lived but some which require medical attention. Bone Spurs in the Neck - Where are they most common? Can Statins Cause Neck Pain?